The clouds surrounding history have finally parted and “The Truth” can now be told. Despite what you may have heard after visits to the Buena Vista in San Francisco, Irish Coffee was not invented in the City by the Bay. 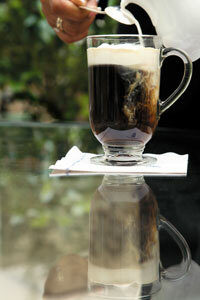 Actually, Irish Coffee came from Ireland. Go figure. Beginning about 1939, as Americans involved themselves with the conflicts in Europe, flying across the Atlantic still wasn’t something done easily. The first stopping point out for the 18-hour seaplane flight from New York and Boston was County Limerick’s Airport, Shannon. The flights didn’t possess the comforts we take for granted today and cabins were chilly. When the seaplanes landed in the North Atlantic waters, most passengers were shivering after a long flight in cold conditions. A young Joe Sheridan, who worked for Foynes catering company that served the airport, saw that most arriving passengers headed straight to the hot coffee. Being a good Irish lad, he thought they would appreciate something a bit stronger. Using only four ingredients – coffee, sugar, fine Irish cream and Irish whiskey – he concocted a drink that proved quite popular with visitors and locals alike. One of the passengers was an Army Lieutenant from California, who felt that the warming beverage would also serve a purpose in his hometown of San Francisco, known for cold, damp conditions year-round. The New Orleans Ritz-Carlton’s Mixologist Chris McMillian and Executive Chef Sean Murphy have reason to celebrate their heritage this month – here’s the recipe for Irish Coffee, as featured at their fine establishment. Preheat Irish Coffee glass by filling with hot water, then empty. Add to hot glass 2 or 3 heaping teaspoons (to taste) of demerara sugar. Add small amount of hot coffee and stir until sugar is dissolved. Add 1 shot of Irish Whiskey and top with additional coffee until 3/4 full. In separate container, stir/whip heavy cream until bubbles disappear and pour into coffee over back of spoon to maintain consistency. Do not stir cream into coffee. Drink coffee through cream and smile.